Background Exercise training in hemodialysis patients improves fitness, physical function, quality of life and markers of cardiovascular disease such as arterial stiffness. The majority of trials investigating this area have used supervised exercise training during dialysis (intradialytic), which may not be feasible for some renal units. The aim of this trial is to compare the effects of supervised intradialytic with unsupervised home-based exercise training on physical function and arterial stiffness. Methods and design This is a randomised, controlled clinical trial. A total of 72 hemodialysis patients will be randomised to receive either six months of intradialytic exercise training, home-based exercise training or usual care. Intradialytic patients will undergo three training sessions per week on a cycle ergometer and home-based patients will be provided with a walking program to achieve the same weekly physical activity. Primary outcome measures are six-minute walk distance (6 MWD) and aortic pulse wave velocity (PWV). Secondary outcome measures include augmentation index, peripheral and central blood pressures, physical activity and self-reported health. Measures will be made at baseline, three and six months. 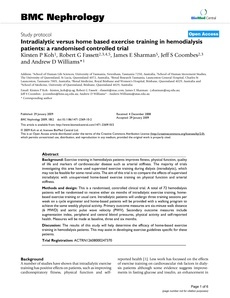 Discussion The results of this study will help determine the efficacy of home-based exercise training in hemodialysis patients. This may assist in developing exercise guidelines specific for these patients.